US Army Specialist Jeremy Morlock, who admitted being part of the ‘kill team’ that murdered unarmed Afghans. An American soldier has pleaded guilty to being part of a “kill team” who deliberately murdered Afghan civilians for sport last year. Army Specialist Jeremy Morlock, 23, told a military court he had helped to kill three unarmed Afghans. “The plan was to kill people, sir,” he told an army judge in Fort Lea, near Seattle, after his plea. The case has caused outraged headlines around the world. In a series of videotaped confessions to investigators, some of which have been broadcast on American television, Morlock detailed how he and other members of his Stryker brigade set up and faked combat situations so that they could kill civilians who posed no threat to them. Four other soldiers are still to come to trial over the incidents. The case is a PR disaster for America’s military and has been compared to the notorious incidents of torture that emerged from the Abu Ghraib prison in Iraq. This week the German magazine Der Spiegel published three pictures that showed American soldiers, including Morlock, posing with the corpse of a young Afghan boy as if it were a hunting trophy. Some soldiers apparently kept body parts of their victims, including a skull, as souvenirs. In a statement issued in response to the publication of the photos the US army apologised to the families of the dead. “[The photos are] repugnant to us as human beings and contrary to the standards and values of the United States army,” the statement said. Morlock has told investigators that the murders took place between January and May last year and were instigated by an officer in his unit, Staff Sergeant Calvin Gibbs. He described how elaborate plans were made to pick out civilian targets, kill them and then make their deaths look like they were insurgents. In his confession Morlock described shooting a victim as Gibbs tossed a grenade at him. “We identify a guy. Gibbs makes a comment, like, you know, you guys wanna wax this guy or not,” Morlock said in the confession. Morlock now stands to be sentenced to at least 24 years in jail but with eligibility for parole after seven years. 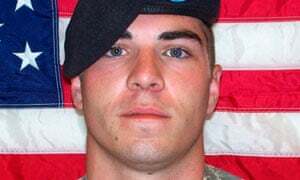 That has come about because Morlock struck a plea bargain that will see a lighter sentence in return for testifying against his fellow soldiers.